Last year, the first week in May, I pulled together a hasty bungalow web tour (the Twin Cities Bungalow Club had canceled their annual live tour and we were going through withdrawal). A few of my fellow bungalow owners joined me in creating a mini-online bungalow tour. It was fun. This year, I thought I'd start a little earlier with more organization. The Twin Cities Bungalow Tour is taking place on May 8th. Anyone interested in joining in on a online bungalow tour for that same day? If you are, drop me an email at: stuccohouse at aol dot com. Let me know the name of your blog & give me a link. Put "Bungalow Tour" in the email's re, so my spam filter doesn't prevent me from reading it :) You do not need to be from the Twin Cities to participate....if you have a bungalow and a blog, you are invited! Then, start thinking about a post that you can put up that day.....your favorite spot in your house, a restoration project, your future plans, the history of your house....anything bungalow related. I'll see who is interested and get back to you with a plan & instructions for linking the blogs. It's that time of year again. 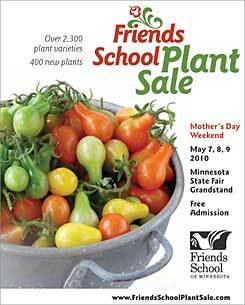 The Friends School Plant Sale catalog has been posted. I've written about this sale, many time in past years....so I'm just going to point you there for the details. Honestly, read their website and download their catalog. So, worth it. Okay, just so we are all prepared. This is what we (well, I...and you vicariously) will be dealing with this summer. You will remember, I took the aluminum trim down almost two years ago. Wow, it doesn't seem that long ago. I had kind of hoped if I waited long enough that the paint would fall off by itself. No such luck. Fun, huh? If you listen carefully, you should be able to hear the sound of my neighbors cheering. Well, after 7 yrs and 5 months, it's official. I've sold StuccoHouse. For many months, I've grown tired of old houses and all of the issues they bring with them. Enough is enough. StuccoHouse will transfer to it's new owner on May 1. I've enjoyed blogging about restoring this old house, but I am off to a blissful life in a new condo in the suburbs. I may start a garden blog.